In the 19th century in the Adirondacks, women had a strong traditional presence in the home. Child-rearing as well as food preparation, small scale farming, and textile production were the typical activities for women in the Adirondacks in the 19th century as in many other areas in America. While men tackled the challenges that accompanied hunting, logging, mining and trapping, women faced the equal challenge of sustaining the lives of their family members. Cooking is perhaps the most commonly depicted scene of domesticity and several of the prints and oil paintings in the Adirondack Museum’s collection depict women engaged in the act of cooking either within or next to homesteads. 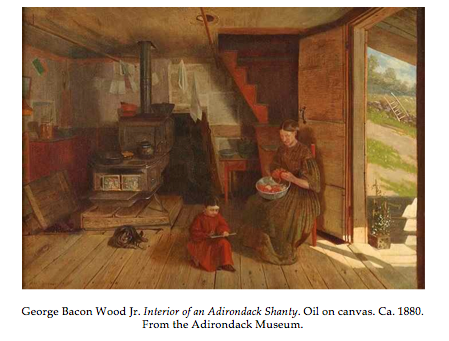 In an oil painting by George Bacon Wood Jr. entitled Interior of an Adirondack Shanty, painted in 1880, we see the interior of a typical Adirondack home furnished with the necessary implements for cooking. The furnishings and objects present in this particular home indicate that this family lived a relatively comfortable existence. For instance, they could afford a large woodstove, a chimney, and substantial cooking utensils. In addition, there is a staircase leading to a second floor, a more luxurious component to the house. The garments of the mother and child in the foreground also represent a certain level of comfort and security. In addition, the small child, a young girl, dons a red dress and writes on a slate perhaps practicing her alphabet. The mother is perhaps the most important figure in the painting. Her hair is pulled back in a simple chignon implying that she has little time for more elaborate, upper-class hairstyles. Her practicality is reflected in her plain, olive-green frock. She peels what appear to be apples into a bowl. We can imagine that she might bake these in the woodstove located in the left hand corner of the picture plane. The woodstove would have likely been used consistently and frequently to bake bread as well. According to the Adirondack Museum, the strong tradition and customs surrounding bread as sustenance have been a significant component of women’s domestic activities in the Adirondacks for centuries and is an important symbol regarding the role of women. Women in the Adirondacks developed and perfected recipes to most efficiently make use of whatever ingredients were available to them in order to ensure a good source of carbohydrates for the men in their families who spent their days mining and logging. Producing bread usually required women to schedule their entire day’s work around the baking process and was a time sensitive activity due to the yeast in the dough. In her account of life in a homestead in the mid 1800s, Mrs. Adolphus Sheldon remembers, “once going to a mill and dusting up flour from behind the bolt that had worms in it, picking them out and so making bread,” (Schneider, 100). Or the liquid kind if preferred in the least. That, makes the bread that makes the man. From this recipe, we can see that baking and cooking were largely generational traditions that mothers would pass down onto their daughters. Stylistically, the mother and daughter wear similar outfits and feature the same hairstyle. Also, their red and green frocks are in complementary colors further visually emphasizing the relationship between the mother and daughter. 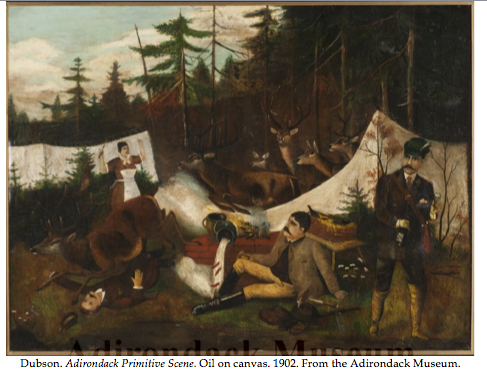 In a second painting, Adirondack Primitive Scene by Dubson, the artist presents a similar scene involving cooking. Although this painting was done in 1902, its themes are still relevant to 19th century understandings of women in the Adirondacks. In this humorous scene, we see a scene of disruption as a herd of deer has run through a campsite and knocked over the boiling pot of sausages on the brick stove. The three men are in various drunken stances, one being tread over by a deer, one sitting, and one staggering with a whiskey bottle in hand. The artist presents these men in a humorous, and perhaps even critical light, as they are elite sportmen, likely tourists, who rather than communing with widlerness, have instead decided to be boisterous drunks. In sharp contrast to the inebriated men, the woman stands with hands lifted. In her right hand she holds a wooden spoon that she has presumably been cooking with. While the main action in this scene is the herd of deer running through the campsite, the woman remains a significant figure. While she has been cooking, the men she camps with have been drinking and lounging after a hunt. While she is the only sober figure in the scene, she is not the central focus, but rather she is shifted to the left side of the picture plane in neutral clothing. This woman, as evident in her apron and her wooden spoon, can be characterized as a homemaker, just as the mother in the previous painting can be. Karl Jacoby reports that the 1880 census of Hamilton County reveals that 94.7% of women in the county, approximately 731 women, were characterized as "Homemakers" whose main task was "keeping house" or "keeping shanty." According to Hamilton County's census, which reflects the wider Adirondack population, this role was the dominant one in the 19th century. The same census reveals that 1.8% of women in the county worked as teachers or nurses, 2.5% worked as servants or hotel maids, and only 1% were glovemakers and dressmakers.